Conheça profundamente a indústria cinematográfica de Bollywood em Mumbai nesta excursão particular de 5 horas repleta de ação. Seu guia é um ator que fornece uma perspectiva privilegiada da indústria durante a turnê do estúdio, a performance de dança e a visita ao museu de Bollywood. Você pode até ver algumas filmagens nos sets do estúdio. Top fora do passeio com almoço em um restaurante local. Seu passeio inclui guia e veículo particulares, taxas de entrada, almoço e traslado e desembarque no hotel. I wish all tours and all guides would be great like this team. Highly recommend tour, you will have great fan time, a lot of laughter and super delicious food for lunch! It was fun to meet some of the local actors. I had a wonderful time in the sound booth - something other tours don't offer! Definitely a great time! My tour guide was outstanding and provided me with so much information and fun facts throughout the day. Tour guide Vishal picked me up, as pre-arranged, at the cruise port and he and the driver drove me through Mumbai and out to one of the Bollywood studios. Such fun at the studio and a great tour of many different sets and stages. I got to see filming of two TV shows as well as Bollywood dancers performing 4 different dances Next we went to a local restaurant for an excellent meal before driving back to the cruise port. I highly recommend this for anyone interested in a small taste of Bollywood. Rahil was an excellent tour guide and went above and beyond my expectations. Being an actor, Rahil knew the ins and outs of movie-making and who's who in Bollywood, giving us an authentic insight to Mumbai's uniqueness in movie-making, much better than Hollywood's Universal Studios. 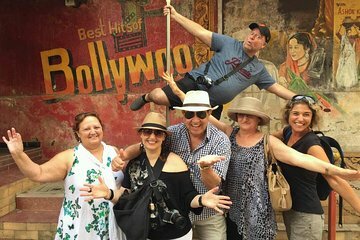 Excellent experience, A great Bollywood Tour. We booked the tour just the night before. It was really easy and everything went smooth. We were picked up on time from our hotel by Rahil who's also an actor with AC car and driver. The private car was modern,clean and comfortable. We saw a several live shootings , dancing show and costume rooms, sets and recording studio. Rahil knew most people at the studio and the stars. He was able to take us everywhere. We were standing with the crew during a live shoot and introduced us to the stars of the movie being shot. Amazing to watch how those movies are made. Rahil went above and beyond to ensure our comfort. A wonderful meal at a nice restaurant was also included. --Thank you again for a wonderful day. Great tour. Fulfilled my expectation of seeing a live studio where movies and tv series are made. Learned some things about visual affects and digital audio and video processing. Definitely worth the time and cost. Tours and Travels Under the guidance of Rahil khan! He is very energetic and Crystal Clear in each and every minute thing ! He Just made our Dreams Come true But showing sets and Meeting Lovely actors! It was really worth the pay!